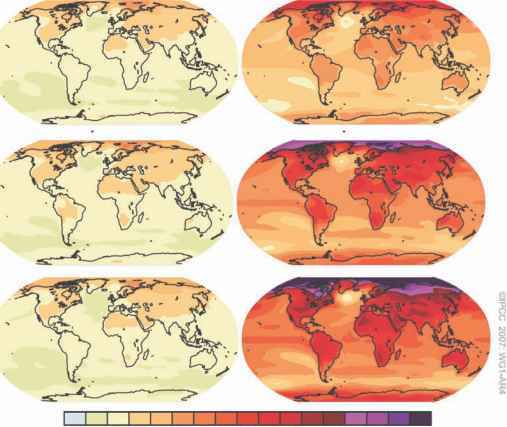 The FAR of the IPCC (2007) describes changes in temperature at different levels of the atmosphere. We will focus only on near-to-surface changes on land as those changes directly influence agricultural production. Results of different GCMs indicate that in both the TAR and the FAR (IPCC, 2001, 2007) global temperatures are to increase. Land and sea surface temperatures will increase at rates never experienced before, and, depending on the emission scenario, these changes are reversible to a certain extent. Warming over sea is predicted to be considerably lower than warming over land areas across all latitudes except below the 43°S and above the 70°N latitudes. The FAR AOGCM ensemble (Plate 1) provides the most sophisticated set of models in terms of the range of processes included and consequent realism of the simulations compared to observations (IPCC, 2007). On average, this ensemble projects an increase in global mean surface air temperature of 1.8°C, 2.8°C and 3.4°C in the B1, A1B and A2 scenarios, respectively, by 2090-2099 relative to the 1980-1999 baseline (IPCC, 2007). There is a range of variation among different models and according to the different geographic areas. In general, agricultural production will be highly impacted if temperature changes go above 2°C (IPCC, 2007; Brown and Funk, 2008; Lobell et al., 2008), and in most of the tropical zones temperatures are likely to increase between 1.4 and 5.8°C in a mediumrange scenario (A1B) by the end of the century. In fact, in a medium-range scenario such as the A1B, a 2°C temperature increase would occur in most geographic areas by the 2050s, and in a high-estimate scenario such as A2, this threshold is far exceeded in the 2020 decade in most geographic areas (IPCC, 2001, 2007). High latitudes and altitudes hold the greatest increments, while low-lying and flat areas show the lowest estimates. Uncertainty in temperature projections is relatively low, as all models predict global warming (IPCC, 2007). Changes in temperatures for Africa are stronger in the Sahel belt than in southern sub-Saharan Africa. Under the A1B scenario, Central Africa receives the least increments in annual mean temperatures, and also in the December-February (DJF) and JuneAugust (JJA) periods. Temperatures in JJA will be markedly more affected than those of DJF and are also above the annual average. The largest temperature responses in North Africa are projected to occur in JJA, while the largest responses in southern Africa occur in September-November (SON). The seasonal structure of temperature responses, however, is modest compared with extra tropical regions (IPCC, 2007). The average increase in global mean temperatures is 1.6°C and 8.4°C by the 2020s and 2050s, respectively, under the A2 emission scenario (business as usual). There is no significant variation in diurnal temperature ranges in the 2020 decade; however, a likely increase from 11.2 to 12.24°C is expected by the 2050s. Cold periods present more significant temperature increases (i.e. 10.2°C increase in the coldest quarter by 2050s) with respect to warm periods (i.e. +6.4°C by 2050s). Northern latitude countries show greater increments in temperatures derived from changing climates. Under the A1B emission scenario, temperatures in Europe would increase more than 2°C by the 2020 decade and by more than 3°C in 2050. The same occurs with North America and Siberia. Asia is the region with most diverse changes (i.e. high spatial variation) due to the combination of tropical and subtropical conditions. In the JJA period, however, temperature changes in northern latitudes are not considerably high. Southern latitudes in Latin America show the least temperature increases, with all models predicting changes below 1.5°C by 2020, below 2°C by 2050 and below 4°C by 2100 under the A1B emission scenario. Differences between models increase towards the future, meaning that impact studies of climate change on agricultural production should be focused on short-and mid-term forecasts. Individual models of the ensemble perform relatively well in comparison to multi-model ensembles. Warming trends in the NCAR (National Center for Atmospheric Research) models PCM (Parallel Climate Model) and CCSM3 (Community Climate System Model version 3) show that even if all CO2 emissions were stopped, global temperatures would increase between 0.4 and 0.6°C by 2100. At the end of the 21st century, warming in the low-estimate climate change scenario (SRES-B1) is 1.1°C and 1.5°C in the PCM and CCSM3 models, respectively, with sea level rising to 13 and 18 cm above 1999 levels (Meehl et al., 2005b). A medium range scenario (SRES-A1B) produces a warming at the end of the 21st century of 1.9°C and 2.6°C, with about 18 and 25 cm of sea level rise in the two models. For the high estimate scenario (A2), warming at 2100 is about 2.2°C and 3.5°C, and sea level rise is 19 and 30 cm. If concentrations of GHGs and other atmospheric constituents in NCAR's simulations are held fixed at 2100 values, an additional 0.1-0.3°C of temperature rise would be expected under the B1 scenario by 2200 and an additional 0.1°C by 2300.